In my many years of photographing trees, I've never seen anything quite as spectacular as the Angel Oak of Johns Island, South Carolina. Its branches grow in all directions, often dipping down into the ground before curving back up again — like some sort of earth-bound version of the Loch Ness monster. Many of its branches are so heavy they require supports in multiple places to prevent breakage. Still, the tree has survived some of the South's worst hurricanes, starred in at least one major TV commercial, and has remained a fixture in the Lowcountry for centuries. Here's what you need to know if you're planning a visit. The single most important thing to know about the Angel Oak is that you absolutely should not sit or climb on it for any reason! It's not a prop for children's photos or a jungle gym to keep kids entertained. Think of it more like a very fragile piece of art. We're talking about a tree that's been around an estimated 450 to 500 years. Those roots potentially burrowed into the soil on Johns Island before the Mayflower landed at Plymouth Rock. The tree pre-dates European settlement and goes back to a time when Native American tribes freely lived off the land. 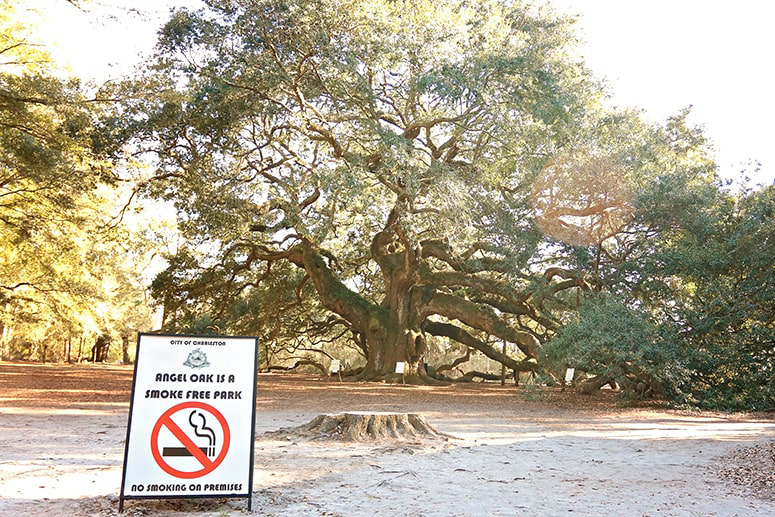 A LOT of effort has gone into keeping the Angel Oak alive and protected all these years! Make sure you follow the rules, which are clearly posted at the entry and around the tree itself. The branches of the angel oak are actually hollow and very fragile. They can damage the root system. They can damage the fragile root system. There are picnic tables nearby (approximately 100 feet away). With all the tourists, it's not a great spot for relaxing anyway. No smoking! It's not allowed anywhere on the premises. Just look at it! It's truly a thing of beauty. I love how the boughs intertwine and twist sideways for 100 feet or more in some places. The longest branch measures in at 187 feet (and still growing). 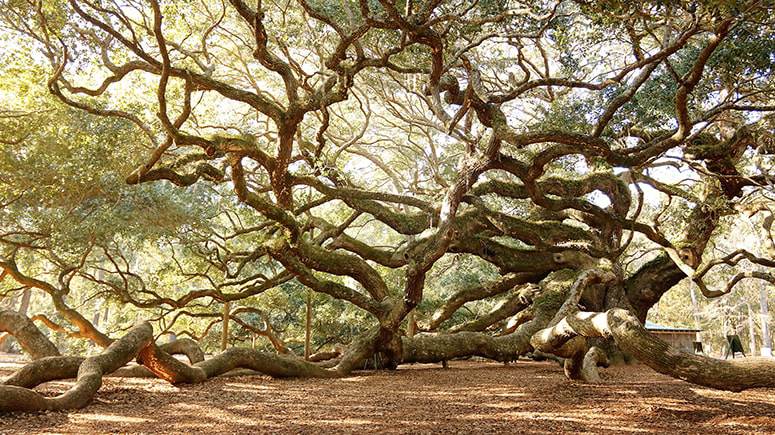 The Angel Oak is a Southern Live Oak, which means it grows outward as much as upward. The canopy is more than 65 feet high, and it provides 17,000+ square feet of shade. That's pretty impressive for a single tree! 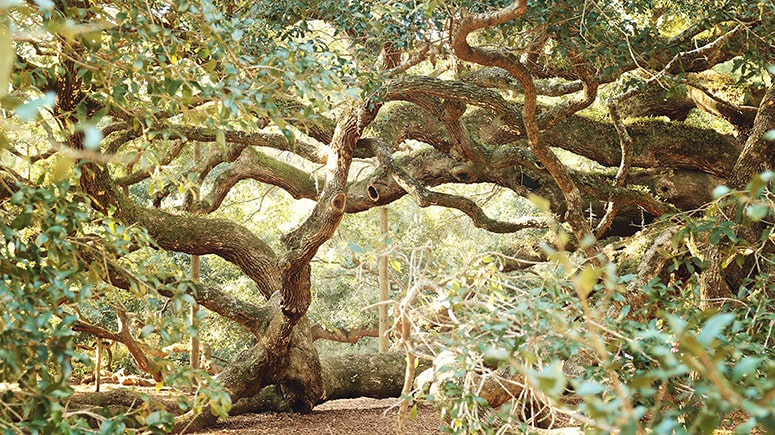 If you're not familiar with Southern Live Oaks in the Lowcountry, they dip and curve in a magical way that almost looks like they were dancing in the wind and suddenly became frozen in time. The green plant you often see growing on the limbs of many southern trees is called Resurrection Fern. It earned the name because it shrivels up and appears to die until a fresh rainfall comes along to “resurrect” it. You can see an excellent sample of Resurrection Fern on this photo I took in one of the squares in Savannah. Notice the steel wire supports stretching down from above, as well as wooden supports below some of the branches to help sturdy the massive limbs of the Angel Oak. As stated on the many signs placed around the tree, the interior is actually hollow. I can't imagine how many squirrels and birds are hiding out in there! If I were a forest creature (First of all: I'd be an owl, for sure), I'd definitely want that tree as my home. Look closely at the trunk of the tree and you'll notice one of the largest openings, but there are holes throughout many of the branches, as well. I can totally see that happening since the wood from a Southern Live Oak is so durable it can withstand cannon fire. That's right…cannon fire! During the War of 1812, the U.S.S. Constitution battleship earned the nickname “Old Ironsides” when it was fired upon from less than 50 yards away by the British warship Guerriere — and the cannonballs actually bounced off its hull. 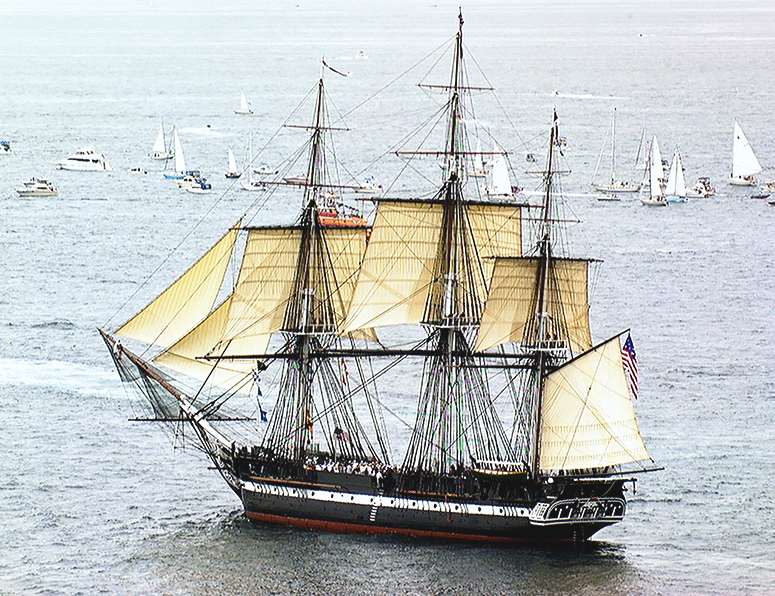 In 1997, the USS Constitution, the worlds oldest commissioned war ship, set sail in Massachusetts Bay, MA for its first unassisted sail in 116 years. The Constitution celebrated her 200th birthday on October 21st of 1997 after completing a 40 month overhaul. Photo via Wikimedia Commons ©U.S. Navy by Journalist 2nd Class Todd Stevens. You guessed it — that hull was constructed from live oak, which is denser than traditional English oak. 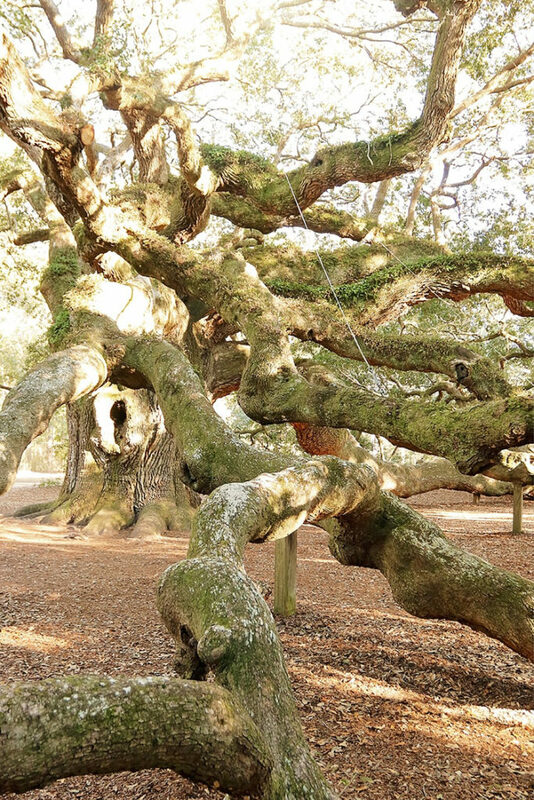 Like nearly everything in the Deep South, the Angel Oak has a complex and sordid history. 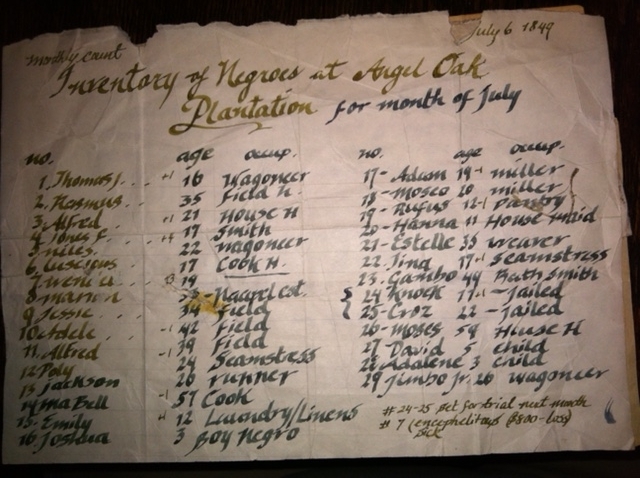 The land where the Angel Oak currently stands once served as a plantation where men, women, and children were enslaved. For that reason alone, I (and many others) consider it a spiritual and sacred place. Whenever I want to learn more about South Carolina's plantations, I turn to South Carolina's Information Highway and the South Carolina Plantations website, which SCIWAY maintains. The South Carolina Plantations website is where I learned that the first recorded owner of the property was Jacob Waight in 1717 and that Isaac Waight inherited the land from him. From there, Charles Snowden acquired part of the property and gave 500 acres to Martha Waight. Side Note: In 1739, the nearby Stono River was the origin point for the Stono Rebellion – a slave rebellion where multiple plantations were burned and approximately 80 people lost their lives. It was the largest slave rebellion that ever occurred in the 13 colonies. In the year 1810, Martha Waight married Justus Angel, and together they grew their plantation to more than 2700 acres. During their ownership, the land became known as the Angel Oak Plantation. By the year 1849, there were at least 29 enslaved individuals registered to Justus Angel. In addition to the individuals listed on that register, I also found Bill of Sale records to Justus Angel for enslaved individuals by the name of Fanny (purchased 06.13.1818), Clytus (purchased 04.15.1818), Sandy (purchased 03.22.1831) and the following individuals (purchased in a group sale dated 03.13.1822): Hagar, Hannah, Harry, Jim, Juday, Mariah, Abraham Markley, Benjamin A. Markley, Moses, Sandy, Tom, and Toney. One of my least favorite parts about writing about the Deep South is researching some of the darker questions that arise about its historical sites. One such speculation centers around whether or not this tree was the site of any lynchings. Some say the name “Angel Oak” came about because people saw the spirits of formerly enslaved Africans encircling its branches. I tried to find records offering evidence one way or the other, but I couldn't locate anything concrete. The closest I could find was a transcript of a conversation with Michael Freeman located on the Lowcountry Digital Library website. In this particular instance, I have to agree with Mr. Freeman; anyone who could provide a solid answer to the question is long gone. Research leans towards the tree being a peaceful place where blacks and whites gathered together, but there simply aren't enough written accounts about the plantation during the 1700s and early 1800s for me to provide a thorough answer. Side note: If you've read my posts about Savannah, you know I'm not one to skirt around the issue and pretend like slavery didn't exist. You only need to listen to the haunting lyrics of Billie Holiday's “Strange Fruit” once to know it was a dark time in our country's history that should never be repeated. If you have 30 or 40 minutes to spare, you can listen to Johns Island historian and Civil Rights activist Septima P. Clark recall her memories of the Angel Oak. She describes how the area around the tree was one of the few areas on the island that wasn't segregated, so everyone in the community was able to picnic beneath it. She also talks about how the tree was considered sacred by the people of Johns Island, how nearly everyone on the island — even the judge — used to travel via ox carts, how women weren't considered Christian if they didn't wear their stockings outdoors (even in the Lowcountry's oppressive heat and humidity!) and how the Angel Oak first became a tourist attraction in the 50s and 60s. Sadly, litter problems around the tree and people carving their initials into its bark also became a problem at that time. Leave no trace, friends. Leave No Trace. 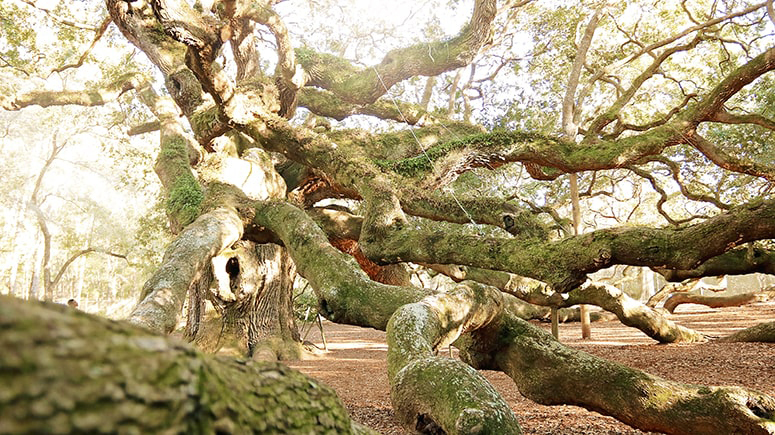 Perhaps it's for the many reasons listed above that the Angel Oak is often seen as a symbol of strength and resilience. After Hurricane Florence, Allstate featured the tree in their popular commercial, Still Standing. They mention one incorrect but often-repeated phrase in the commercial when they say, “…some say the oldest living thing east of the Mississippi”. That's most likely untrue (unless the Angel Oak is much older than estimated), since there are bald cypress trees in both North Carolina and South Carolina that are more than 1500 years old. 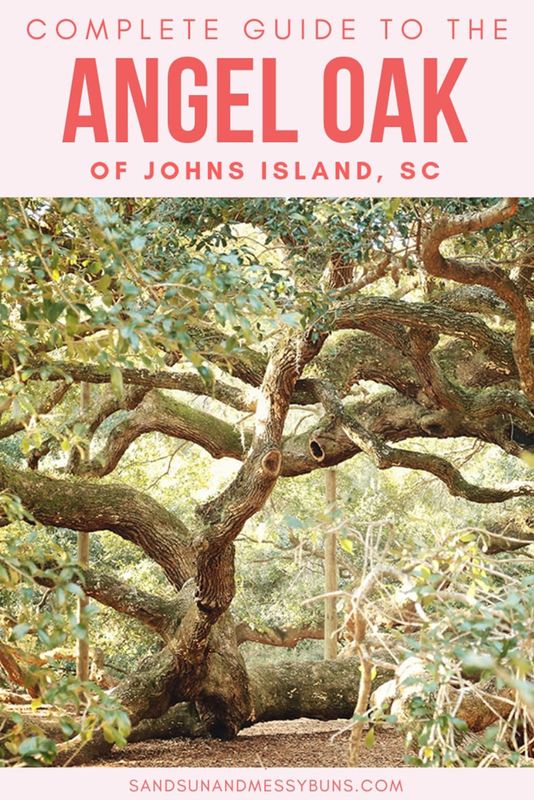 In recent years, the Angel Oak has survived a few devastating hurricanes, including Hurricane Matthew in 2016 — a Category 5 hurricane that did quite a bit of damage to the entire Lowcountry area. The only modern hurricane to cause damage to the Angel Oak was Hurricane Hugo in 1987. If you're driving from Savannah, I-95 to 17 is the fastest route. It's not a terrible way to go, because that route takes you through Yemassee where you can easily visit the Old Sheldon Ruins. (Highly recommended!) Here's a map where I've included a few other points of interest you might want to check out nearby and along the way. Click on each icon on the map to learn more about the attraction and to get the specific address to enter into your GPS. If you're looking for a place to stay in Charleston, I suggest The Dewberry (always a classic) or Zero George Street (incredibly relaxing and beautiful). When visiting the Angel Oak, you'll have to exit off of a paved road and drive behind a church on a dirt road for a short amount of time before arriving at the property. The tree sits on fenced property and is under constant surveillance, so if you go after hours, please don't try climbing the fence. It's not lit at night anyway, so you wouldn't be able to see anything. Plus, you'll risk getting arrested for trespassing or criminal mischief. During visiting hours, the gates are open and you can park in the on-site dirt surface parking lot. There's also a small log cabin that contains a gift shop. The “last entry” time for the parking lot is 4:50, but sometimes they close the gate 10 or 15 minutes before last call. (You can still get out, you just can't enter.) They also temporarily close it during thunderstorms. Porta-potties are available next to the parking lot, but a better option would be to go to a nearby restaurant or gas station. There are plenty of options within a 5 mile radius! The land is currently owned by the City of Charleston. Because the tree's root system is so intertwined with the adjacent forest, the Lowcountry Land Trust purchased the surrounding acreage in 2014 to protect the area from further development. Or, if you'd prefer to purchase a print of one my photos of the tree, just let me know. I'll donate $10 from each purchase to Savannah Working Against Human Trafficking (SWAHT) to help fight against modern forms of slave labor and human trafficking. Email hello[at]sandsunandmessybuns.com to inquire about available print sizes. The Candler Oak in Savannah, GA – Estimated at approximately 300 years old, The Candler Oak sits along the northeastern edge of Forsyth Park and is listed on the National Historic Register of Trees. 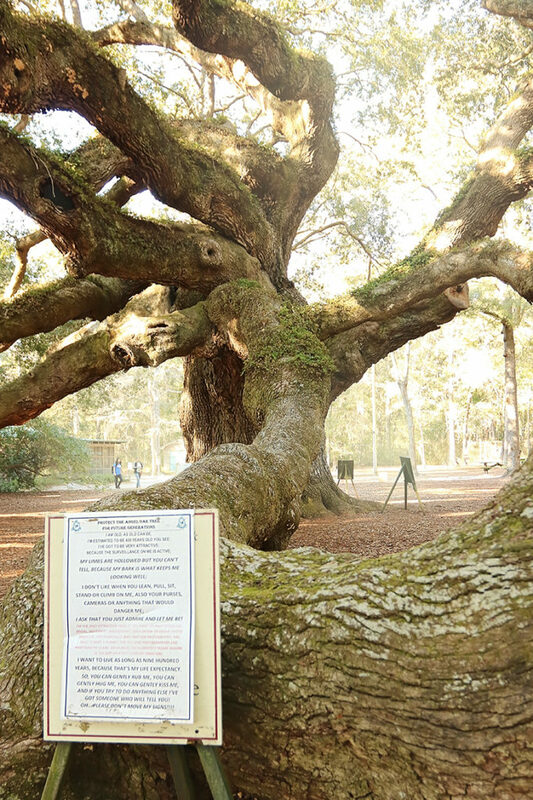 Lover's Oak in Brunswick, GA – It has an official plaque from the National Arborist Association stating it was in existence in 1787 when the U.S. Constitution was signed, but the tree is considered much older than that. Although living trees are difficult to date, it's estimated to be 900 years old. Liberty Oak on Hilton Head Island, SC – The Liberty Oak is located in Harbour Town and is approximately 300 years old. Sea Pine's founder, Charles Fraser, who was one of the early developers on Hilton Head Island, is buried beneath it. Talbird Oak on Hilton Head Island, SC – Located in beautifully landscaped Hilton Head Plantation, it's estimated to be approximately 300 years old. Cherry Hill Plantation Oak in Beaufort, SC – This one grows on relatively undeveloped land in Beaufort that formerly operated as the Cherry Hill Plantation. It's approximately 400 years old. 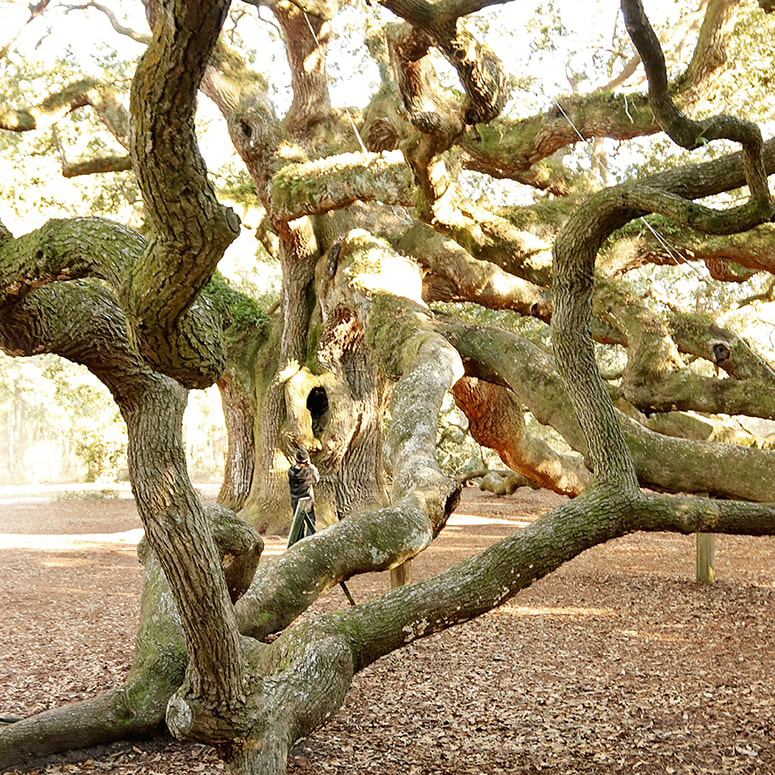 Grandfather Oak in Charleston, SC – The Grandfather Oak is possibly the oldest known oak tree in SC. It's located in Charleston's Magnolia Cemetery, and arborists estimate its age at somewhere between 800 – 925 years. The trunk is 25 feet around and the branches spread to 117 feet. Wow, I'm pretty sure that's the most I've ever written about a tree! This post turned out a lot longer than expected, but if I left any questions unanswered, feel free to let me know. 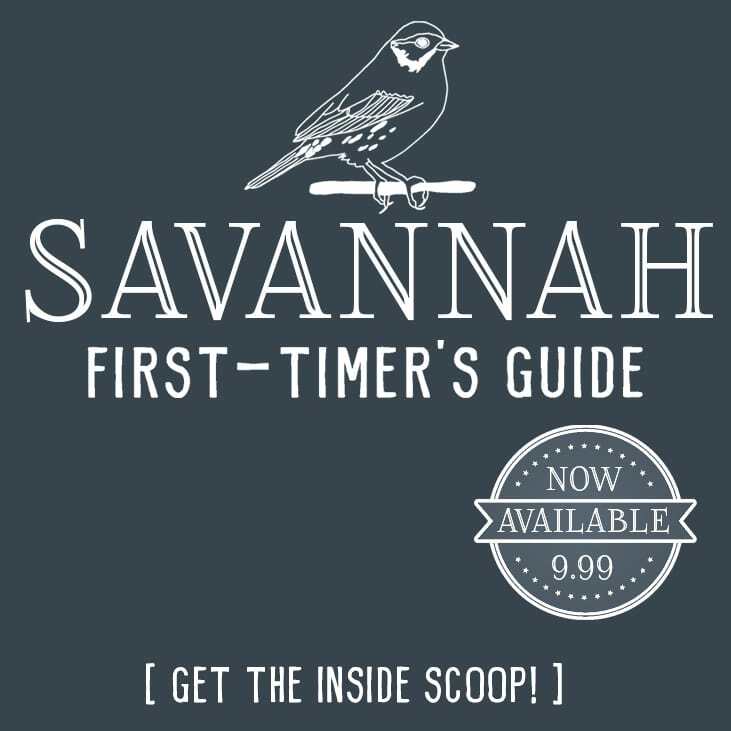 Head over to Instagram to join me and see more photos in and around the Lowcountry, sign up for my emails to get the inside scoop about where to explore, and be sure to purchase a copy of my Savannah First-Timer's Guide if you're planning a trip to Savannah! Holly! This is super detailed. I’ve seen the Angel Oak and it’s glorious but I love that you’ve given me a thorough history lesson! Also, very interesting about the conservation effort. It’s nice that you can direct readers to donate. It’s certainly worth it! It’s really detailed, but I fell down a rabbit hole when I was researching it. I decided to include all of the information I discovered in case anyone else was super curious about it (although I know those chances are pretty slim). And yes, I’m so happy they preserved the land around it!